It’s September already? Where did the entire summer go? Although I am really excited to start putting together some great fall décor & warm up our home a bit for the season, I think time is just flying a little too fast! Do you agree? 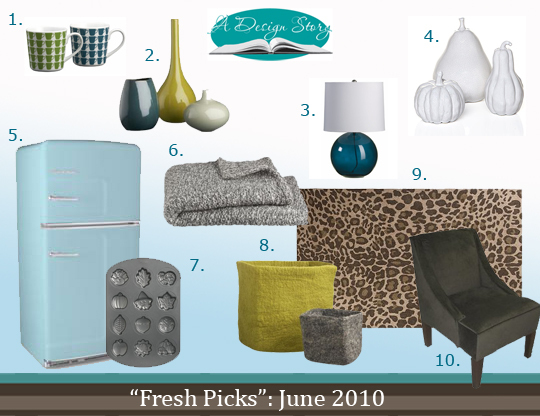 In preparation of making our home a little warmer and adding some “spice” into it, I came across so many comfortable and cozy colors, fabrics, furniture & more! As always, it is so hard to narrow down the findings, but this month these were the “winners”! So, what do you think? Is shopping in the future?? Do tell! With summer at its close, these “faves” are great for the in between season & longer! Happy shopping! Do you have a product you are dying to tell us about or share for a giveaway? Feel free to comment or email us and share!! Remember, we are having a fabulous sale on our design packages… a whopping 45 % off of ALL DESIGN PACKAGES IN “Our Shoppe” with the coupon code: Favorite. Do Enjoy! Also, do you have a blog or store you want to showcase? We are offering some really great deals this month for advertising and giveaways… click here for details! P.S. Have you recently renovated your space or have a DIY Project that was successful? Well, we want to showcase it right here on A Design Story! Just email lindsay@adesignstory.com for details! P.S. We are having a fabulous Giveaway this week… click here. Mood Board courtesy of A Design Story,LLC. This post was shared at This Blessed Nest! i love all these picks. you are so right as well, they are so fresh & crisp. those white pumpkins & felt storage baskets….ummm, hello. gorgeous. such a fun post to look at everything. thank you so much for linking up with the FALL FESTIVAL. so nice to have you. I am so glad you liked my post! I loved linking up to your fall party! Hopefully I can start my fall decor and link up again!